This is my first iOS app, so it was definitely a learning experience, but I'm happy with the what I shipped! I'd love to hear your feedback and I'm already planning new features and UI improvements for the upcoming versions. It looks nice at a glance, but it's really hard to make out any details in those screenshots. Any chance you can up the size of the images in the carousel (preferably to full 1024x768)? I'll look into getting the iPad to scale up with larger window sizes. All five codes have been used. All codes are used (to save other readers the trouble). Impressive for a first app, what did you use? Thanks, it's all native for the most part. Will this work with Github Enterprise? 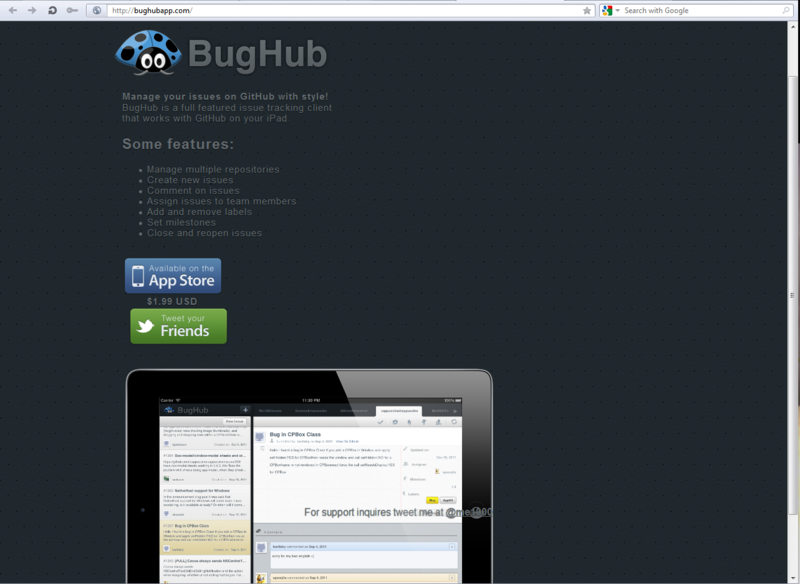 If you (or anyone else interested in BugHub on GH Enterprise) want, email me at randy dot luecke at [ME] dot com because I'd love to work with you to, hopefully, get it in the next release. you dishing out any more codes? if not that's cool. The app looks very well done! Looks very nice - purchased! I know some of my iPadless colleagues would love an iPhone version. Any plans to add universal support? Or even a separate version? I've had several inquires about this. I'm hesitant to talk about what I might do in the future, but if the market is large enough for an iPhone app I would certainly be open to making one. Since GitHub has their own iPhone app I'm not sure how much of a market there is for a comercial iPhone app. I think the market for a Mac app might be a bit larger, so I'd love to know what everyone thinks about a version of the app for either the iPhone or OS X. A Mac app with notifications for new issues would be awesome. We use pull requests extensively at work, and it's annoying to have to periodically keep refreshing the webpage to see if things have been integrated yet. +1 for the OS X app. I definitely know less git-savvy types that loathe having to use the Github just to access the issue tracker. I would prefer both a Mac version and an iPhone version better than the iPad app. Posted ^^this before I was reminded that Github released their own iPhone-only issues app. Thanks for giving the iPad some love though! I think you might be missing a profitable niche. Github already has a great website and a github:issues iPhone app. Github customers are overserved. On the other hand, companies that use FogBugz, are underserved. All iPhone FogBugz apps are crappy. FogBugz mobile website is barely usable. If you created a FogBugz client, you'd face no competition to speak of, and an (admiteddly smaller) market of customers who pay $25/mo for each developer account. Which means you could price your app higher and people would still buy (I would have no problem with paying $40 for a FogBugz client — a good one). Not to diminish your accomplishments, because it's a lovely looking app, but why not target the desktop first? Are you planning to? I decided to tackle iOS as a learning experience. I've put some initial work into a desktop client, but as people have show here there seems to also be a demand for a better iPhone app... So I don't want to commit publicly to either app... But I do want to gauge the demand for either and iPhone or Mac version. There already is a Github Desktop client... it's your browser. Video took too long to load, so i closed the window. Your sales page should load within a few seconds max. How much time did it take you to develop? Why you did not do combined iPhone/iPad app? Based on your experience, is it more effective to develop combined app or separate iPad and iPhone? What learning resources would you recommend to start developing iPad apps for a newbie? I've been working on it for a few months now... The product had several iterations, first as a cappuccino app, then as a Mac app, then finally I decided I'd learn more by building an iPad app. I didn't build a universal app because I didn't have the time to make it. I wanted the experience to be great, and I wanted to ship by December (I was three months late). So I can't comment on how difficult it would be. I am a core team member for the Cappuccino Framework, so I know Cocoa (on OS X) pretty well... The transition for me wasn't too difficult... I just used the apple documentation. Is the code derived from a Cappuccino version, or did you build it from scratch using iOS? I wrote the Cappuccino app along with Ross back in the day... The app shares some concepts, but the code is written from scratch. grabbed it from your code. promise a nice (honest too) review after using it on the app store. good luck!